There ya go! That is the schedule for next week. I usually don't blog on weekends but I plan to write up all of my posts this week and have them all scheduled to post on each day. I'm so excited! This is something I wouldn't normally do. I don't like people seeing the imperfections in my home but I think this will be a good thing. I hope you can all join me! Like I said you can link up finished rooms, unfinished rooms or even rooms in progress. I want to see it all! To RECAP from my first post. I will be sharing my home with you all next week AS IS. No room in my home is completely finished with the exception of the shared nursery and instead of waiting to finish each room I thought I would let you all tour our home NOW just as it is! 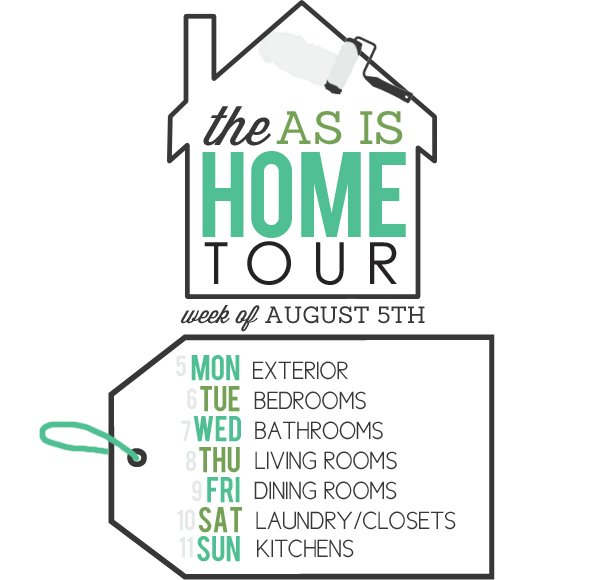 There will be a link up at the end of each post so you can link up and share your home with me too! CAN'T WAIT! Help me spread the word and use this button on your page! Specially if you plan on participating! :) THANKS! !